Scottie Lindsey drives to the hoop. The senior guard scored 13 points in the loss to Ohio State. 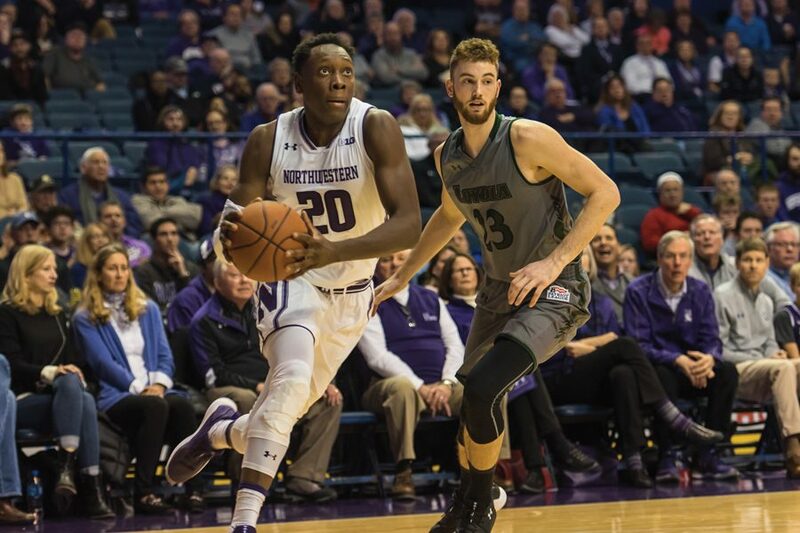 ROSEMONT — In the middle of a bleak January both outside and inside Allstate Arena, a Scottie Lindsey 3-pointer seemed like the spark that might lead to a long-awaited night of validation for Northwestern. But Lindsey’s triple — which ended a streak of 11 consecutive 3-point misses by the senior guard and pulled the Wildcats (11-9, 2-5 Big Ten) within 3 points of No. 22 Ohio State (16-4, 7-0) with 43 seconds remaining — ultimately became the closest NU would get in the second half of a 71-65 loss Wednesday night. A Lindsey foul 17 seconds later spoiled what was shaping up as a quality defensive possession, Ohio State’s C.J. Jackson made two free throws and junior forward Vic Law missed a 3-pointer on the other end to effectively kill the Cats’ hopes. On the bright side, five players scored in double digits for the hosts, led by Law’s 14 and Lindsey’s 13. The team certainly took a significant step forward offensively following last weekend’s disaster in Indiana — they shot 45 percent overall and 52 percent in the second half, assisted on 19 of 26 field goals and generated 26 points in the paint. Freshman guard Anthony Gaines yet again proved to be an energetic spark plug off the bench, hounding the Buckeyes on both ends of the court while tallying three steals and 10 points on 3-of-5 shooting. Collins said he has been encouraging Gaines to match his ever-present defensive confidence on the offensive end, and that well-roundedness showed Wednesday. The Cats also kept Ohio State star forward Keita Bates-Diop largely in check, allowing him to make only four of 12 shots, but were instead burned by a perfect performance from backup center Micah Potter (5-for-5 with 13 points) and a consistent night by Jackson (12 points, eight assists). Collins said he found out only about 20 minutes before tip-off that sophomore forward Aaron Falzon couldn’t play, as a minor back issue suffered in practice Tuesday flared up during warmups. Senior forward Gavin Skelly started in Falzon’s place and led a hot start by the hosts, scoring 7 points in the first six minutes to power his team to a 12-6 lead. Ohio State then erupted on a massive run to take a 33-25 lead into halftime. When that advantage stretched to 15 points early in the second half, the game seemed to be spiraling into a non-competitive blowout yet again — but NU, for once, managed to right the ship. The Cats made some crucial buckets down the stretch, including a pair of threes by Gaines and a pair of and-one plays by junior center Dererk Pardon to keep it competitive and then eventually cut into the deficit. Nevertheless, they weren’t able to make the needed stops on the defensive end, as Ohio State rode its 54 percent second-half shooting to its seventh consecutive conference victory.